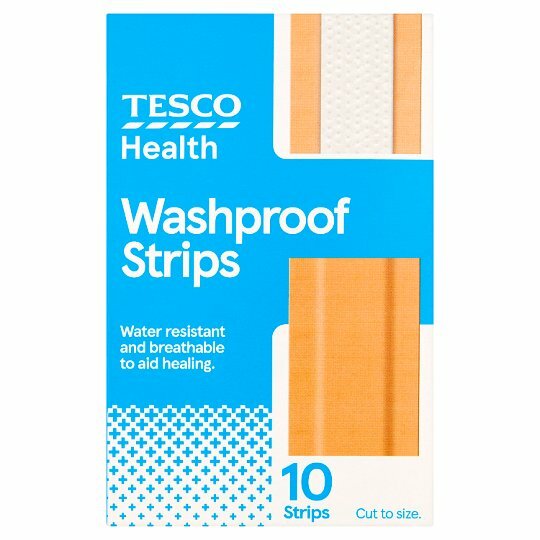 Tesco Health Washproof Strips provide water resistant protection from dirt and germs and are breathable to aid healing. The strips can be cut to the exact size required and use a low allergy, latex free adhesive so are kind to skin. Water resistant and breathable to aid healing. Cut to size. Clean and dry wound and surrounding area. Cut strip to desired length Position pad over wound and press down the edges firmly without stretching. Change the dressing as required, at least daily.